This one just sounded a little too different not to get it our there and share it. After getting into the recipe a little bit more it actually sounds pretty good. Sorry this is a no go for anyone watching their dairy intake but overall it is very good for you. Hope you enjoy. -In a small skillet sauté the onion until it has softened, about 2-3 minutes. -In a mixing bowl whisk together the eggs, milk, salt, pepper and hot sauce until combined. -Whisk in the zucchini, quinoa, onion and 3/4 cup of the shredded cheese. 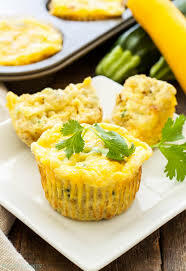 -Pour the mixture evenly into each muffin cup and top them with the remaining 1/4 cup shredded cheese. -Back on the middle rack of the oven for 18-20 minutes or until the eggs are set. -Remove from the oven and serve.